Based in Tel Aviv, Golany Architects is a design-focused practice that has previously covered projects ranging from urban design to landscape architecture. Combining the expertise of a large architectural with a high level of personalised service, their projects have become highly acclaimed, both in Israel and all over the world. 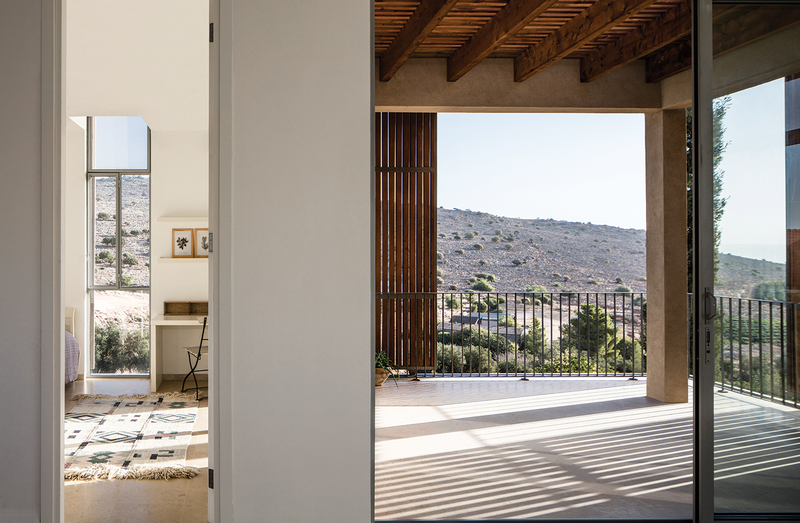 Recently, Golany Architects have completed the build if a residence at the end of a village in the Jordan valley, overlooking the wide open Israeli landscape and nestled close to the Sea of Galilee. The brief was for a residence that embraces and engages with the ancient landscape around it – it was important for the design team to maintain continuity between the plot and its surroundings. 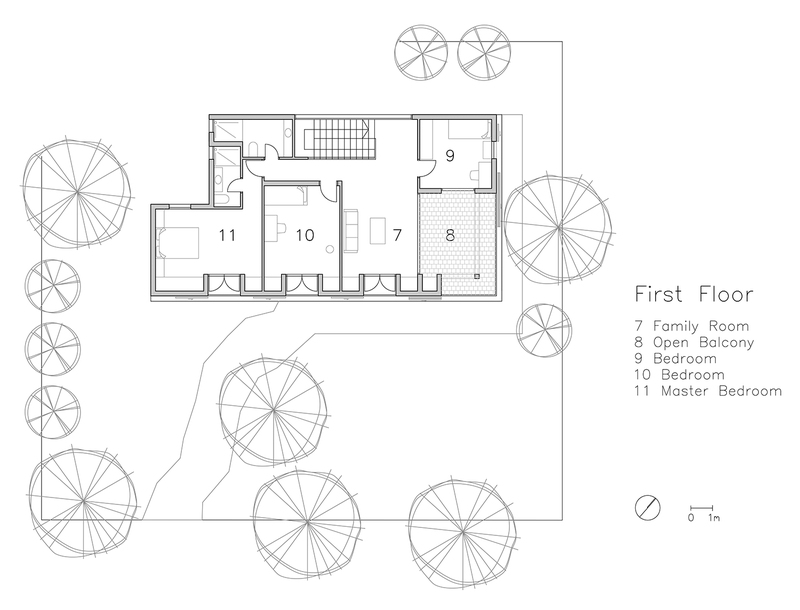 For the project, Golany Architects determined the exact level of the house in a fairly unorthodox manner; the design team and clients made their way to the empty lot, and climbed a ladder until they caught a view of the Sea of Galilee in the near distance, above the mountainous surroundings. The levels of the house were then carefully measured and decided upon, in order to provide views of the landscape with a minimal rise above ground level. Living areas of the residence are situated on the ground level of the residence, with a garden that gives the impression of extending towards the horizon – through fields all the way to the Sea of Galilee. Considering the lot size was only 500 sqm, Golany Architects made the decision to split the house over two floors, to make sure there was enough outdoor space. 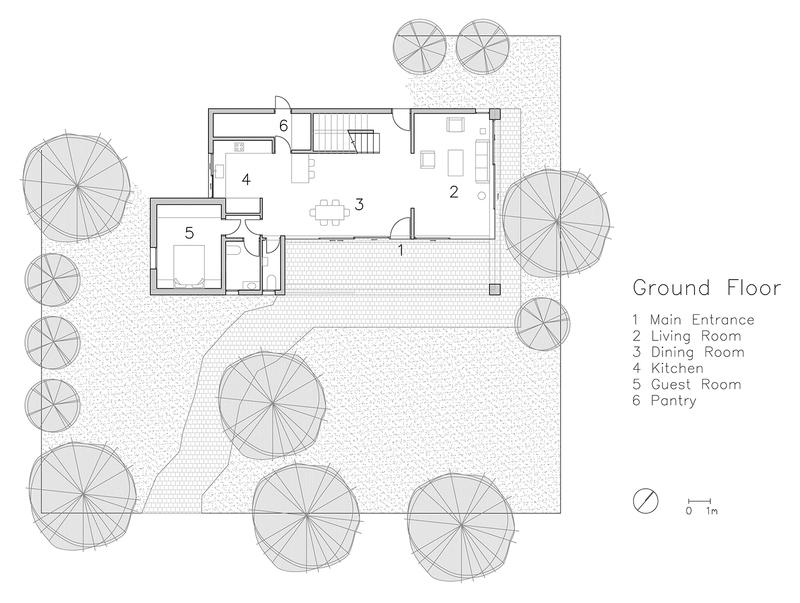 The residence’s bedrooms, and a family room, are situated on the first floor; they are open to the sweeping view of the terrain from above the tree tops, and are adjoined by a pergola covered terrace. Large windows face the south and east, providing plenty of natural light to the building. However, shutters which slide and adjust - depending on the sun’s position - have also been fitted in order to provide shading. 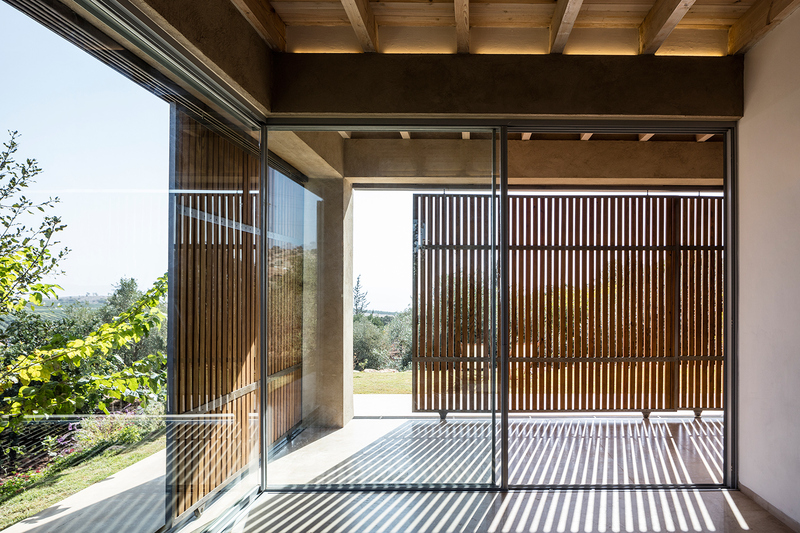 Environmental and sustainability considerations were taken into account throughout the design process; the shutter lattices are typical of Mediterranean mashrabiya, and block outside views to offer privacy for residents, whilst still allowing them to enjoy the scenery from the inside. The light rays that penetrate through the shutter slits create a rippled, ever-changing look from the interior when the sun shines on the wood. 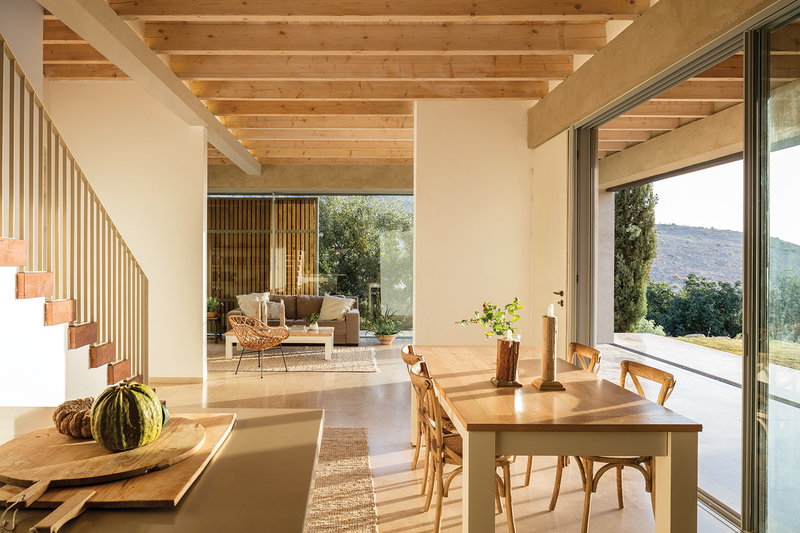 Despite the heavy heat that is typical of in the region, the house stays cool – even during the hottest of summer days – thanks to a ‘double-skin envelope’ that has been designed to improve the climate control. This ‘envelope’ was created by having the large windows and doors of the house recessed slightly from the shutters’ outer façade. Spaces reminiscent of outdoor rooms were designed between the doors and the shutters, enabling residents to sit outside whilst their privacy and intimacy is maintained. On the ground floor, Golany Architects designed this space to work as an outdoor living room under a covered balcony, enabling the residents to utilise as much of the outdoor space as they want whilst staying cool. Small balconies have been created in the bedrooms between the two layers of the house ‘envelope’ – the windows and the shutters. A contemporary interpretation of the traditional terrace, these balconies offer unobstructed views to the private garden and beyond – including to the Sea of Galilee and the Golan Heights. 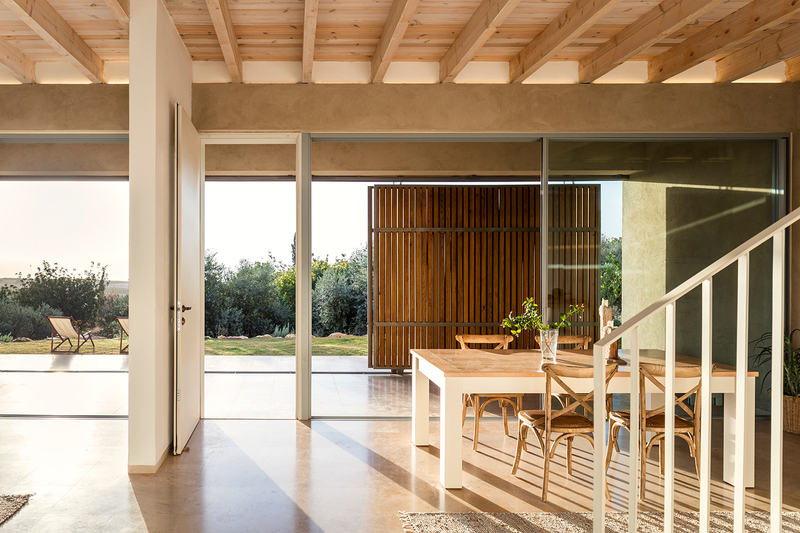 Golany Architects have built this residence with the aim of integrating it into the pastoral surroundings; the rugged soil, Olive and Carob groves and yellow-brown palette of the environment were inspirations for the material choices. The design team matched the colours with their cement textured plaster, and the timber shutters. 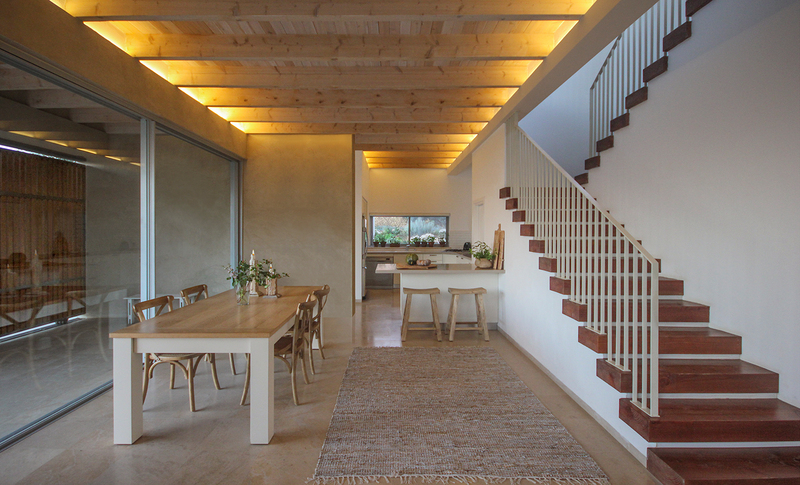 Light brown stone was used for the interior paving, and the wooden ceilings feature large, elegant beams. With the environment at the forefront of the design, Golany Architects made sure to maintain the mature trees on the lot during the residence construction – including a cypress tree at the corner of the lot, and an oak tree situated next to the living room window. Within the garden, rosemary, lavender and spice plants were planted, filling the air with the local fragrances and capturing the ambience of the environment. Lead Architects: Galit Golany, Yaron Golany. Photographs: Amit Geron, and: Golany Architects (04,09,11,13,17,20,21,23,24b).